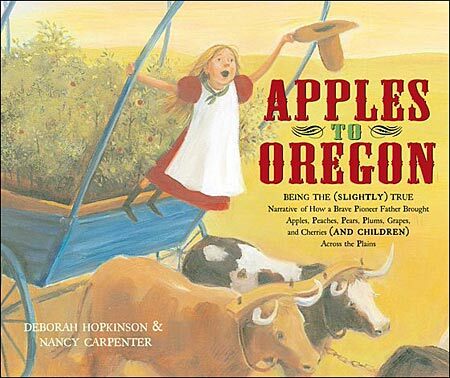 Apples to Oregon is a charming tall tale that tells the story of young Delicious and her family, who have set off on the Oregon Trail to build a new life for themselves out west. Since her daddy can't bear to leave behind his beloved fruit trees, they build a special wagon to hold hundreds of fruit trees in addition to their other belongings. Good thing Delicious is along because they run into many challenges en route and it's resourceful little Delicious who comes up with creative solutions to save her pappa's much loved trees. The bouncy, tall tale story is perfectly paired with Carpenter's adorable illustrations. 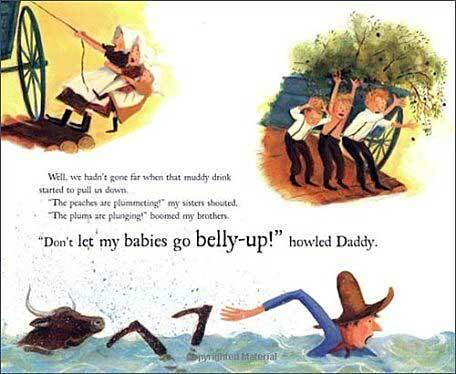 Each spread is awash with color and full of humorous little details befitting a tall tale for kids. Delicious is so adorable and plucky that your students will be cheering for her throughout the book. Be sure to read the author's note at the end to your students (or at least paraphrase) because this book is loosely based on a family that did, in fact, bring hundreds of fruit trees across the plains and then set up a prosperous orchard that is considered today to be "the mother of Oregon nurseries." Most third to fifth graders should be able to read this book on their own, as the reading level falls within the average reading level range of third graders. Most second graders will struggle some to a lot with this book, so perhaps for that age level it is better as a read aloud. This book was an American Library Association Notable Children's Book 2005, a Society of Children's Book Writers Award winner in 2004, and a School Library Journal Best Book of 2005. As you are reading Apples to Oregon, you may need to remind your 'inner teacher/parent' that this is a tall tale because, truthfully, there are a few disconcerting aspects to the storyline. Daddy seems to care a great deal more about his fruit trees than his kids. And little Delicious gets herself into some very precarious situations (ie: wandering off on her own in the middle of the desert in search of water.) We haven't seen the kids take note of these particular aspects, however, so no sense being a 'spoil sport' and ruining the fun of this story by bringing it up. This is a tall tale, not a historically accurate picture of the pioneer trail. It's fun, and should be read as such. Submitted by teacher Leesa Martinez: We are learning about tall tales and improving our letter writing this year, so I decided to blend the two into one activity that uses this book. I read Apples to Oregon to the class, and then I have the students write Delicious a letter! I tell the students to pretend they are Delicious's best friend who she had to leave behind in Iowa when her family set out on the Oregon Trail. I tell them to imagine that they heard about what happened to Delicious's family not in a book, but in a letter they just got from Delicious, and they are writing her back. My only direction to the students for this writing activity is that they must use proper letter format and they must tell Delicious what they think of her adventure in at least four detailed sentences (no "That sounds cool"). Then, if they would like, they can add to the letter by making up their own tall tales about what they have been doing since Delicious and her family moved away. Virtually all the students do, and it's pretty funny. If you are teaching the American frontier, you probably have tall tales in your curriculum as well. In most states, the two are taught in the same year. Apples to Oregon is a great book to read after students know a bit about life on the pioneer trail, as they will be more educated about what may be exaggerated or minimized about this story. On a personal note, I just finished reading The Journal of Douglas Allen Deeds (My Name is America) about the Donner Party, so the juxtaposition of these two books so closely together really made the whimsical, tall tale nature of this title really stand out! One book makes the Oregon Trail seem like a great adventure and the other makes it seem like a frighteningly dangerous endeavor. Both books do exactly what they set out to do, and we highly recommend both. Neither one is "right" about the Oregon Trail. It's just interesting to have the context to compare them. If you read this book near the end of your pioneer and tall tale units, students will have the knowledge necessary to be able to discuss the tall tale aspects of this story--what is an exaggeration, what is minimized, and what is accurate.